As You Enter the 22nd Week of Pregnancy it is a Good Time to Start Thinking About Possible Baby Names. 132 DAYS TO GO. . .
Are you feeling not as sharp as normal? If so you may be experiencing "pregnancy brain". "Pregnancy brain" can cause you to become forgetful and you may find yourself having trouble concentrating. These symptoms are the result of major hormonal changes that accrue as part of every pregnancy. 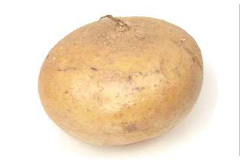 Your baby is about the size of jicama during week 22. Your Uterus is expanding to accommodate your rapidly growing baby. You may notice stretch marks developing on your belly and your belly button may start to pop out from the expansion. The Eyes are moving under the still fused eyelids. Development of the iris is occuring. Tooth buds are developing below the gum line. The Hands are reaching and grabbing the face and umbilical cord. The Ears are able to pick up sounds. Loud sounds may make your baby respond with a startled movement. The Bones now contain bone marrow which is creating red and white blood cells. The size of your belly is a good indicator of your baby's growth and will be regularly measured by your doctor. This measurement is taken from your pubic bone in your pelvis to the top of the uterus or fundus. This measurement should correlate with the number of weeks of your pregnancy. 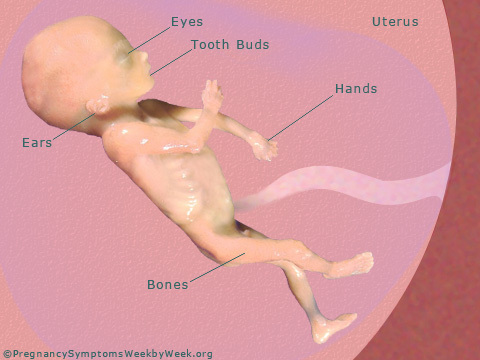 So at 22 weeks of gestation you should be about 14cm to 20cm. 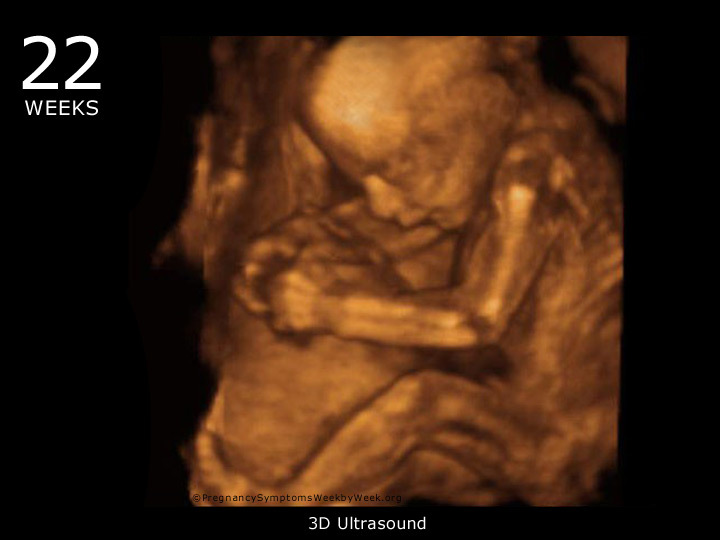 If you are significantly larger or smaller compared to the average on a gestation growth chart you will be referred to an ultrasound scan which can offer a much more accurate measurement. Growths on your cervix or cervix inflammation can produce light vaginal bleeding from time to time. If you experience light vaginal bleeding inform your doctor at your next visit. Heaving bleeding in the second trimester can suggest a potential problem with your placenta and you should contact your doctor as soon as possible. In some women, the placenta can pull away from the wall of the uterus causing bleeding. Very rarely a uterine rupture can occur; however, it is more common in women who have had a cesarean section in the past.